Antique Show was held annually in May (date to coincide with the York Antique Show) with a preview night and refreshments. Was held at East Berlin Community Center at 405 N. Avenue off King Street (Rt 234) in East Berlin. The Dealers offered 18th and 19 Century textiles, paintings, tin wares, toys, dolls, ceramics, ironware and antique "smalls". See Photos From 2015 Show Here! Christmas House Tour held in the even years (biennially). See photos of the 2018 Tour here. 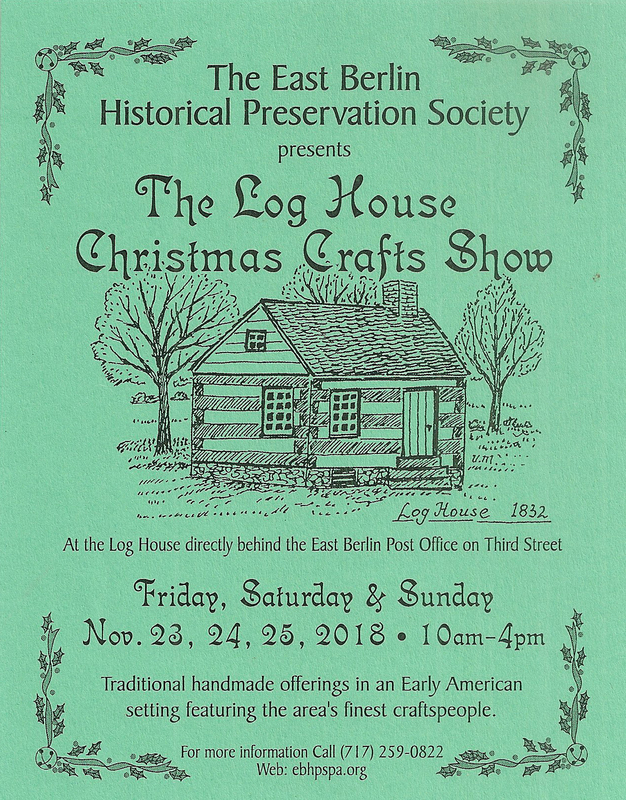 A Christmas Craft Show is held the weekend after Thanksgiving on Friday, Saturday and Sunday from 10 am to 4 pm at the Log House in East Berlin. See flyer (from 2018) for more information. This show is lots of fun and there are lots of beautiful crafts available for purchase! Mark your calendars: The next Christmas Craft show will be Nov. 29, 30 and Dec. 1, 2019 from 10 am to 4 pm at the Log House in East Berlin.